1. Preheat the oven to 170°C/325°F/gas mark 3. Put the flour, sugar, baking powder, salt and 40g of the unsalted butter in a free-standing electric mixer with a paddle attachment (or use a handheld electric whisk) and beat on slow speed until you get a sandy consistency and everything is combined. 2. Pour in the milk and vanilla extract and beat on medium speed until all the ingredients are well mixed (scrape any unmixed ingredients from the side of the bowl with a rubber spatula). Add the egg and beat well for a few minutes to ensure the ingredients are well incorporated. 3. Divide the chopped strawberries between the paper cases. Spoon the cupcake mixture on top until two-thirds full and bake in the preheated oven for 20 to25 minutes, or until light golden and the sponge bounces back when touched. A skewer inserted in the centre should come out clean. Leave the cupcakes to cool slightly in the tray before turning out onto a wire cooling rack to cool completely. 4. Meanwhile, make the frosting by beating the icing sugar the remaining 20g of the unsalted butter together in a freestanding electric mixer with a paddle attachment (or use a handheld electric whisk) on medium-slow speed until the mixture comes together and is well mixed. Add the cream cheese in one go and beat it until it is completely incorporated. Turn the mixer up to medium-high speed. Continue beating until the frosting is light and fluffy, at least five minutes. Do not overbeat, as it can quickly become runny. 5. Roughly break up the digestive biscuits and put them in a food processor. Process until finely ground. When the cupcakes are cold, spoon the cream cheese frosting on top and finish with a sprinkling of finely ground biscuits. 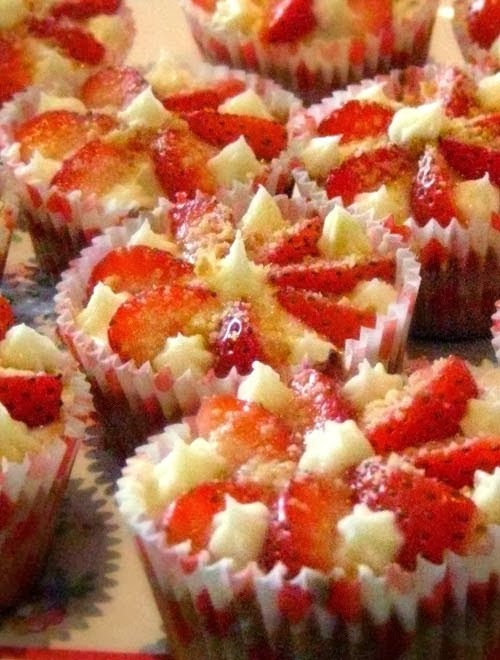 For similar treats, see the recipe for cheesecake-filled strawberries.